by Adam Goodheart for The New York Times Magazine. Fort Monroe and the "Contrabands of War"
for the Fort Monroe National Monument, by the National Parks Service. by Eric Wills for Preservation, National Trust for Historic Preservation. Music from Colonial Williamsburg is now available on iTunes (search Colonial Williamsburg), Amazon, and CDBaby! Favorite albums, such as From Ear to Ear, Marching Out of Time, A Grand Entertainment, Keys to the Palace and more are available for digital download. 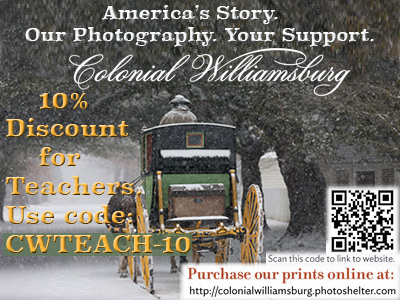 Teachers receive a discount on Colonial Williamsburg images on Photoshelter! Explore slavery's pervasive influence across the American colonies. 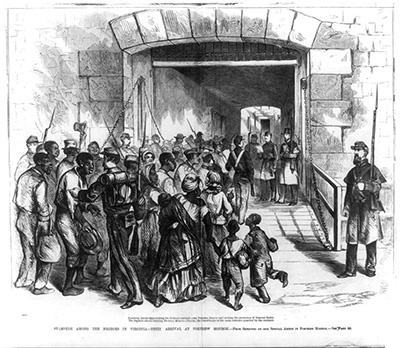 This unit includes lessons on the transatlantic slave trade, slave labor and regional economies, slavery and the law, African American culture and life under slavery, and the beginnings of the antislavery movement.